This is going to be the office I will be working the next two years. 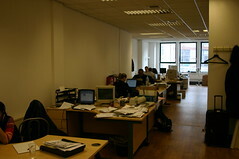 We are about 10 people working in this office in the business district of London. On the right hand side, you see my suitcase that got lost last Sunday, when I arrived. Fortunately they found it again and they send it to my hotel. Luckily, I had all important accessories in my handcarry.